Near New York’s Lincoln Center, PCS is the school where the talented kids who star on Broadway and in ballet, film, TV and sports get their college-prep, academic education. 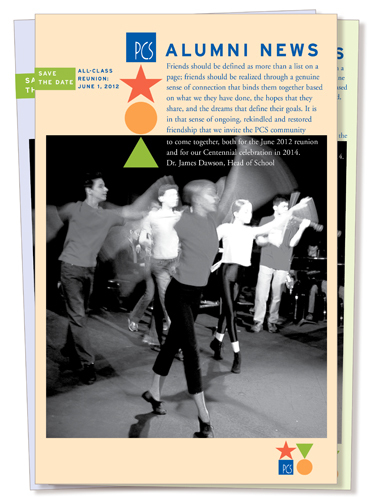 The logo palette, like the young dancers, is nimble and can change form as needed to complement the medium. There can be no more effective fund-raisers than the students themselves, who can touch donors’ hearts with their talents and smiles. This accordion folder fits neatly into an A-8 envelope with a personal note — and can be proudly displayed on parents’ and donors’ desks. 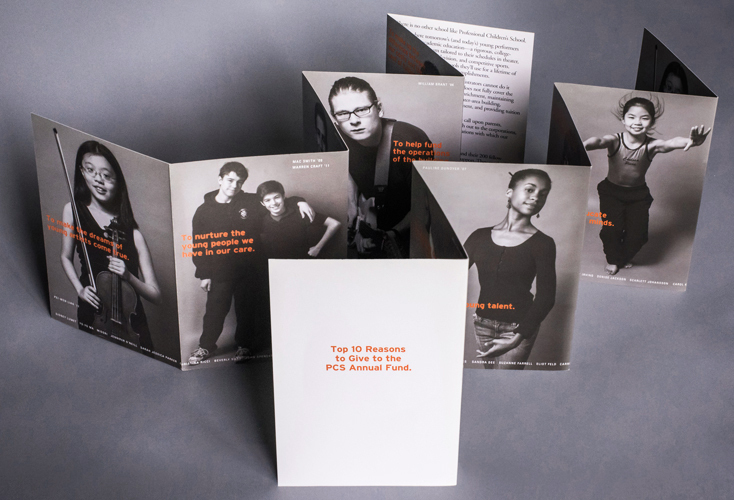 Close-ups of the same students were shot at the same time by Peggy Barnett for “The Faces of PCS” annual report. Case statement by Visual Language LLC helped PCS raise the nearly $7 million needed for a major building renovation, which gave them a new theater, upgraded science and computer labs, and a rooftop gym.